Also serving communities of Mcconnelsville. 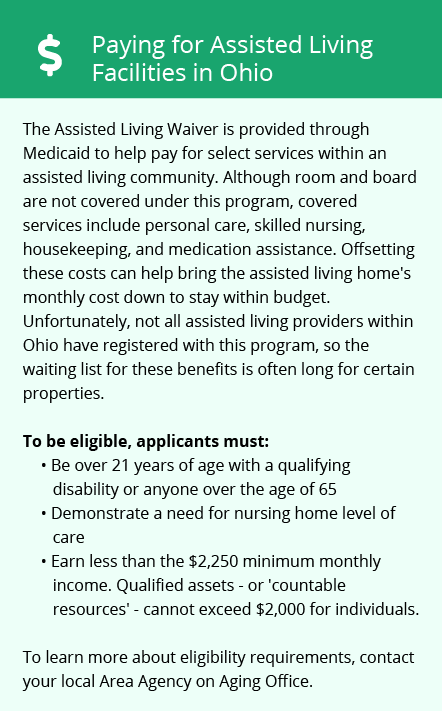 The average cost of assisted living in Zanesville is $3,135 per month. This is lower than the national median of $3,346. Cheaper nearby regions include Newark with an average starting cost of $2,575. To help you with your search, browse the 20 reviews below for assisted living facilities in Zanesville. On average, consumers rate assisted living in Zanesville 4.1 out of 5 stars. Better rated regions include Newark with an average rating of 4.3 out of 5 stars. Caring.com has helped thousands of families find high-quality senior care. To speak with one of our Family Advisors about assisted living options and costs in Zanesville, call (855) 863-8283. Zanesville, OH, was briefly the capital of Ohio, from 1810 to 1812, when the national Democratic-Republican Party was trying to monopolize power in the new state. The capital shifted to Columbus in 1812 as a compromise. Afterwards, Zanesville remained a well-known city - but for a different reason: it's prolific pottery industry. Today the city of Zanesville is home to eight assisted living communities licensed through the Ohio Department of Health’s Office of Health Assurance and Licensing. The department encourages staff at Ohio's assisted living communities to help seniors live active, independent lifestyles by helping them with normal activities of daily living (ADLs), such as grooming and taking medication. Weather in Zanesville is typical for southeastern Ohio. Summer highs here get up to 84 degrees Fahrenheit, while January lows dip to 20 degrees Fahrenheit. Cold, snowy winters can make outdoor activity difficult for seniors with respiratory conditions, such as COPD. The cost of living in Zanesville is just a little lower than typical for the United States. Seniors who buy their own groceries may pay up to 4 percent less here than elsewhere in the nation, while the cost of health care is around 1 percent lower, which helps seniors on fixed incomes whose insurance is limited. Ohio's state income tax takes from 0.495 to 4.997 percent out of the paychecks of most wage earners, and local taxes can rise as high as 3 percent of wages earned. These taxes don't affect seniors' SSI, and many forms of retirement income are likewise exempt. Seniors who do their own shopping or pay for their own gas may notice a 6.5 to 8 percent sales tax. Crime in Zanesville is about one-third higher than the national average in most categories. The property crime is relatively high, but down significantly from the city's 2011 highs. South East Area Transit (SEAT) operates a multi-city transit network in Zanesville that reaches almost to the border of West Virginia. Buses of this service are ADA-compliant, and seniors with valid transit ID qualify for a discount at the time of boarding. The Zanesville area is home to world-class medical facilities, including Genesis Hospital, in the event of medical emergencies or illness. Assisted Living costs in Zanesville start around $3,135 per month on average, while the nationwide average cost of assisted living is $4,000 per month, according to the latest figures from Genworth’s Cost of Care Survey. It’s important to note that assisted living rates in Zanesville and the surrounding suburbs can vary widely based on factors such as location, the level of care needed, apartment size and the types of amenities offered at each community. 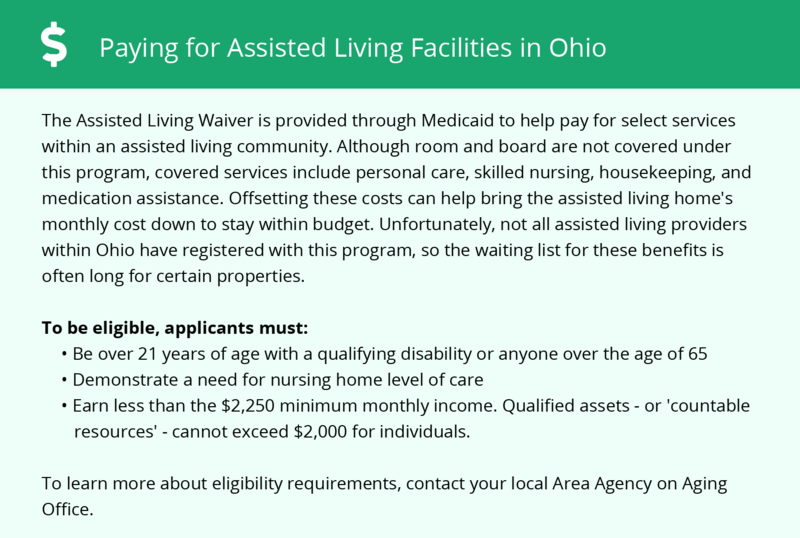 The Assisted Living Waiver program and residential state supplement help Ohio's aging citizens pay some or all of the cost of assisted living. Zanesville and the surrounding area are home to numerous government agencies and non-profit organizations offering help for seniors searching for or currently residing in an assisted living community. These organizations can also provide assistance in a number of other eldercare services such as geriatric care management, elder law advice, estate planning, finding home care and health and wellness programs. To see a list of free assisted living resources in Zanesville, please visit our Assisted Living in Ohio page. Zanesville-area assisted living communities must adhere to the comprehensive set of state laws and regulations that all assisted living communities in Ohio are required to follow. Visit our Assisted Living in Ohio page for more information about these laws.